Implementing ground-based water monitoring and measuring networks is costly and due to networks deterioration in some cases also unreliable. Developing countries in particular need affordable, yet reliable solutions and tools for monitoring available water resources. The BlueDot Water Observatory service is based on the Copernicus satellite imagery that provides timely information about water levels of lakes, dams, reservoirs, wetlands and similar water bodies globally. The key benefit of the service is the accumulation of current and historic global water level data in one place. Because of its cost-effective approach anyone is able to access water level information freely. Not only water authorities but also citizens can now better understand the state of their local and global environment. Thanks to the wet winter season 2018 in Western Cape the prospects for Day Zero in Cape Town in 2019 are very low. The water levels of the Theewaterskloof Dam acquired through the BlueDot web application. 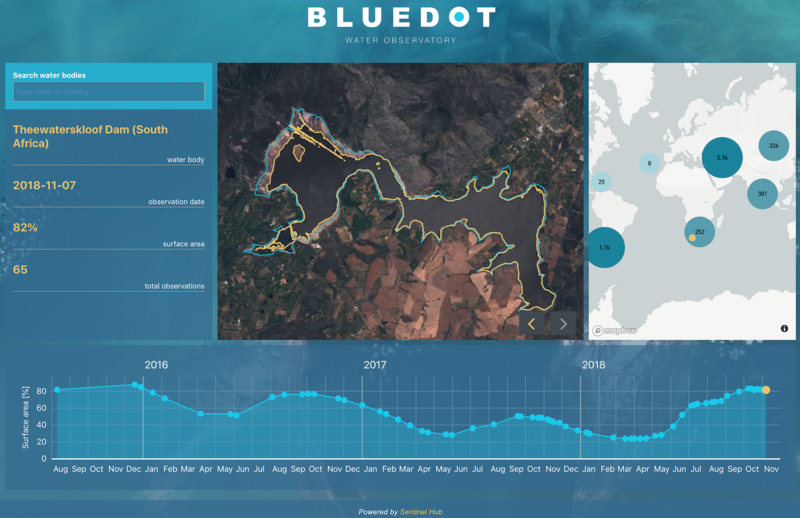 All observations are provided and can be explored interactively through the BlueDot Water Observatory Dashboard, which alread includes more than 7,000 water bodies. New data are constantly being added according to the water risk ranking map provided by World Resources Institute. Who can Benefit from the Water Observatory? The BlueDot provides a valuable service to local authorities, governmental agencies, natural parks and reserves, agricultural ministries and agencies, stakeholders in food production, and citizens alike. The BlueDot technology is an open-source and it can serve as a starting point, a reference, around which a larger, predictive analytics-oriented business focused on exploitation of satellite imagery can be built. Check out the full story on Water Observatory in our blog post, including links to global database of water bodies, and open-sourced code for water detection algorithm and front-end dashboard. If you have any questions, suggestions or feedback, write to us via email or Twitter!